Congratulations to Sergeant Brian Schweers on his outstanding performance and finish in this challenge. State Trooper Named ‘Fittest Cop’ In MD During CrossFit Open – Can You Do 55 Handstand Push-Ups? April 5, 2017 (PIKESVILLE, MD) – A Maryland State Police trooper committed to physical fitness has been ranked the ‘fittest cop’ in the state after competing in a series of CrossFit® workouts. Sergeant Brian Schweers, of the Special Operations Division, has been ranked CrossFit’s fittest cop in Maryland, after completing a competition series of five workouts over five weeks. 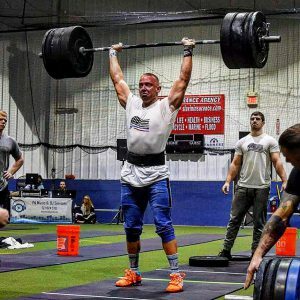 He is also ranked as the seventh fittest cop in the Mid-Atlantic region and the 82nd fittest police officer in the world, according to CrossFit rankings. CrossFit describes it program as ‘varied functional movements performed at high intensity.’ The workouts Sgt. Schweers was tested on involved exercises that include dumbbell snatches, burpee box jump-overs, weighted walking lunges, power cleans, bar muscle ups, squat snatches, chest to bar pull ups, deadlifts, and handstand push-ups. These varied and intense exercises use weights, aerobics and a limited amount of time to challenge the strength, flexibility, intensity and endurance of the athlete. Sgt. Schweers understands the benefits of being physically fit, especially in a career as a police officer. His fitness level enables him to endure the rigors of his assignment in the Special Operations Division as a member of the Special Tactical Assault Team Element, the Maryland State Police SWAT Team. Physical training is a major emphasis in the Maryland State Police Academy for incoming trooper candidates. Programs are in place to encourage continued physical fitness throughout a trooper’s career.